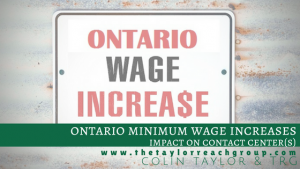 How Ontario minimum wage increases will impact contact center | The Taylor Reach Group Inc.
As many of you have heard, Ontario has announced a minimum wage increase to $15/per hour. This topic has been very controversial as some are in favour of, and others opposed. This jump in wages raises many questions and concerns as organizations and individuals try to anticipate the effect of Ontario wage increases. This has been a topic of conversation with Taylor Reach and this post distills a number of the relevant points of view and perspectives examined in our internal discussions. What will be the impact on the economy? What will be the impact on small businesses? What will be in impact on Call and Contact Centres? This change is a huge lift (30%+) in the minimum wage which is great for the workers being compensated at minimum wage levels. While some argue that minimum wage increases at these levels will only contribute to inflation, there is some validity to the argument that this increase will create more disposable income in the province, thereby leading to more investment and more job creation longer term, with some inflation and cost-of-living increases possible. If you look at this from a business perspective, specifically small business, it is a substantial increase on a percentage basis – 32% to be exact. This will be difficult for small businesses to absorb. The most affected industries are expected to be retail and hospitality and Contact Centres. The perception is that larger businesses that are diversified are likely paying their employees more than this anyways, and so it is likely their entry level staff that will be most likely affected by this wage increase. However recent stories on this topic by the CBC cited the fact that more than 50% of all minimum wage earners work for large companies. When you look in Ontario, the majority of Contact Centres are in-house and support inbound customer service. These in-house Centres generally pay more than their outsourced compatriots and many are already paying more than minimum wage and maybe near or above the $15 per hour threshold so the effect will be less dramatic. When you look at outbound telemarketers, most of them are already moved away, to avoid the hindrance of government rules such as “do not call” etc. Because of this, telemarketers are often offshoring to countries such as Pakistan and India, where no local jurisdiction limits their calls or content, and thus local minimum wage increases have no impact. That being said, the minimum wage increases will inevitably impact Contact Centres in Ontario. Many outsource or third party Contact Centres pay at, or near minimum wage. We know of a number paying $12 - $14 per hour today. The increases in Ontario, are going to cause people looking to build Call Centres, to look elsewhere; where wages are lower and/or are more reasonable. Would you build a Call Centre in Ontario if you had an equally good location in Atlantic Canada that is going to cost $2 $3 less/hour to operate, for hundreds of your staff? That’s the million-dollar question. I think a lot of organizations are going to look at whether or not they need to be in Ontario. One could make the argument that other provinces will shortly, following Alberta’s and Ontario’s example of increasing minimum wages. This wage migration to $15 per hour, I think, in part, depends on the economies of other provinces. It is interesting that Alberta, whose economy is in the tank, was the first province to announce this wage increase. Keep in mind that no provinces have actually made this move yet, rather, they have just announced their plans and talked about it. There is an argument to be made that this is nothing more than the current Liberal government of Ontario, dangling a carrot, to start buying votes in advance for the next election, as you will notice this increase is scheduled to be implemented after the next election. There are a lot of provinces where the economy is quite sluggish, and so they would have a difficult time trying to match the minimum wage increase. I’m not sure that anyone is going to start packing up their boxes and putting away their phones tonight and do a midnight move to Nova Scotia, but certainly, as they’re looking where to add staff to Centres and facilities, they may look to add them elsewhere. The Contact Centre industry has always been subject to labour arbitrage and a wage increase in one jurisdiction that can lead to the work being migrated to lower cost locations. This is the underlying principle behind the growth in Contact Centres locating to Atlantic Canada and to the off-shoring trend. I believe some Centres in Ontario will eventually close and move and I think you will see more investment going to other provinces where the wages are lower. It’s interesting that within the US; they have really polarized toward “right-to-work states.” These states give employers more rights over hiring and firing employees than in non ‘right to work’ states. It is more difficult to unionize in ‘right to work’ states, and they tend to have lower wages. These states use this as a lever to try and attract more jobs, growth, and employment. Dallas is the fastest growing city in the US and Texas is a “right to work” state. You may find this type of ‘right to work’ economy created in Canada; where you will have some high and some low minimum wage provinces, with the lower wage provinces using lower wages as a lever to try and attract more investment. Minimum wage increases in Ontario does make a difference for the main outsourcers in Ontario. They need to change their pricing structure as they risk becoming too expensive which in turn will cause outsourcing clients to do it themselves. Outsources will need to change the way they operate and look at value add – what else can they bring to the table - it's not just going to be price focused anymore. Will Ontario Outsourcers Change Site Location to Avoid Increasing Minimum Labour Costs? Ontario is the second province to increase their minimum wage to $15/hour which will likely put pressure on the other provinces to do the same. This has a direct effect on outsourcers as this raises the question “How likely are other provinces to adopt Alberta’s and Ontario’s minimum wage increase?” There is no point in moving if the changes will be made, soon enough, in other provinces. So, what should Ontario outsourcers do? Again, this goes back to pricing structure – outsourcers need to adjust their pricing structures. In the outsourcing business, this is going to translate into higher rates for their clients serviced out of their Ontario, or Alberta Centres. This will make Ontario Centres less competitive compared with other Centre options that large outsourcers operate today. The higher cost in Ontario will likely lead to the closure of Centres as outsourcers migrate business to lower cost Centres within their networks. If you’re a large outsource BPO organization, and you have hundreds of Centres, including 30 Centres in North America, why would you be paying $15 in one area, where you could be paying $11 in another? You’re probably not going to maintain that Centre. I predict that as outsourcer’s leases expire, they will begin transition staff and clients to other Centres as quickly as possible. In the outsourcing business, this is going to lead to loss of jobs and loss of investment in Ontario. Raising the minimum wage will have a dramatic effect on those earning minimum wage. That is obvious; they will be getting more money for the services they render. But think it through, a raise of 32% will force labor intensive businesses, already reeling with thin margins, who rely on entry level staff to rethink their business model. Small technology businesses, where technical support is a Cost Centre, will work towards deploying alternative channels of support. In a word, automation. For instance, virtual agent based self-help, currently available at sub-dollar-per-contact, can replace an entry level agent without a great deal of effort as the type of issue cleared by entry level agents are, by their very nature, simple enough that automation satisfies these contacts. A virtual agent is available 24x7, never shows up late, never in a bad mood, scales well and consistently delivers a known level of support. We already discussed the impact on Contact Centres and Call Centres, but what about other businesses in Ontario? While some businesses will be affected minimally, let's discuss the industry verticals most affected – retail, food and beverage and hospitality. Retail and food and beverage industries traditionally pay near the bottom of the food chain. Organizations in food service, retail or hospitality, can’t just move all locations to other provinces. These verticals are simply stuck with the minimum wage increase, which is going to translate into higher prices for consumers. While this article is focused on the effects on business and the economy, let us not lose sight of the overall effects on the provincial economy. Yes, some business will have to adjust, change and possible even end. However, people earning at the bottom end of the wage scale, those in temporary or ‘gig’ work tend to spend much of their income immediately. This boosts the overall economy and creates more wealth for all of us with their spending. This means that businesses, retailers, Call Centres, fast food, beverage and hospitality can expect a boost in revenue as a huge number of workers can now afford to spend. It is like Henry Ford when asked why he paid his worker so much replied, “Because then they can afford to go out and buy a model T”. The raise in the minimum wage only brings the poorest amongst our workers up to an income level that many of us may have been fortunate to experience in the early part of our careers. People need a ‘living wage’ and an income that enables them to be a part of our society and not just wage slaves. Feel free to join the conversation and share your insights on the effect of Ontario minimum wage increases.